$5 Mail In Rebate wyb (1) Disney My Friends Tigger and Pooh DVD and (1) Pedialyte product. $5 Mail In Rebate wyb (2) 750 mL Bottles of Little Black Dress wine. $10 Mail In Rebate wyb any combo of ( 2) 750mL or 1.75L Bottles of Canadian Mist, Early Times, or Old Forester AND a 12pk of any Beer. Go here if you would like a printer friendly version of this list! Don’t overlook the two Prevacid coupons in Today’s USA Weekend magazine. They are located on page 3. One is for $6.00 and one is for $10.00. Rite Aid has released a new coupon – $3.00 off $15.00 purchase. I can’t even imagine the deals that we will be able to get when combined with this coupon. Go here to print the coupon. It’s coming to the end of the month and if you have waited to print any coupons you had better do it now. New coupons are starting to show up and others may disappear soon. There will be 1 insert in this Sunday’s newspaper – 1 Smart Source. Go here for a sneak peak! Regional differences are to be expected. It has been reported by Money Saving Mom that Right Guard Deodorant is free at Kroger this week. It is on sale for $1.00. Go here, print the Right Guard coupon and buy two deodorants and they will both be free! I checked at my local Kroger tonight. 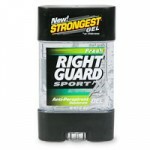 Right Guard deodorant is $1.55. So, this isn’t a free item for my area, but it is still cheap! Go here to print a coupon for 20% off at the Coach Factory Store. The coupon expires February 28th. The Children's Place Winter Clearance and Coupon! The Children’s Place has clearanced many of their items. There are shirts, pants, jackets, and shoes all $2.99 or less. Combine these awesome prices with this 15% off coupon (click on the picture above) and you will have a great deal. The coupon can be used in the store or online. For an even better deal, go to the Children’s Place through ShopAtHomeand receive 5% back plus an additional $5.00 if this your first time signing up with ShopAtHome. The coupon is good through March 16th, 2010. Limit one coupon per customer. This coupon is not available any more. Go here to print a coupon for $1.00 off 4 cans of Red Gold Tomatoes. Bath and Body Works has released a coupon to receive a free home fragrance or signature collection body care item with any $15.00 purchase (up to $12.50 value). Go here to print the coupon. To use the offer online use the code FLOWER. This offer expires March 14, 2010.